The goal here is to create a private network shared with selected VMs and the host, while offering NATing to connect to the Internet. VMWare offers some documentation, which works great with DHCP, but I needed to specify everything static for custom needs. Unlock the screen by clicking on the lock. Add a custom network by clicking on the +. Make sure all options are checked (see screenshot). Specify a subnet IP, I will be using 192.168.200.0. Activating the DHCP here is needed for the host to connect to it, even though our VMs will be using static IPs. Make sure your VM is powered off. 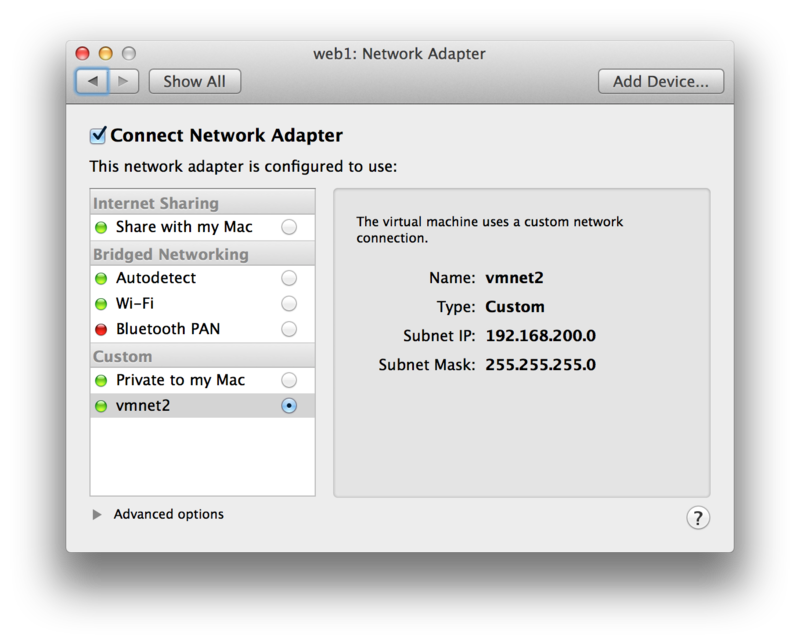 Select your newly created network (for me it was vmnet2). You can add more VMs to this private network, just remember to change the IP from 192.168.200.100 to something else from 192.168.200.3 to 192.168.200.253. The official mysqldump supports more or less two output styles: separate INSERTs (one insert statement per row) or extended INSERTs (one insert per table). Extended INSERTs are much faster, but MySQL write them all in one line, the result being a SQL very hard to read. Can we get the best of both worlds ? Only problem is, lines will be split, even in the middle of strings, altering your data. mysqldump will make sure lines are not longer than 5000 (or whatever), starting a new INSERT when needed. The problem is that the behaviour is kinda random, diffs are hard to analyze and it may break your data if you are storing columns longer than this. This question has been often asked without a proper reply, so I decided to write a simple parser. Precisely, we need to check for quotes, parenthesis, and escape characters. The only flaw that I can think of is that the parser will fail if the 10001st character of a line is an escaped quote, it will see it as an unescaped quote. Ever heard of iso-8859-1 ? Yeah… that nightmare… With it, my name ends up more often than not… SÃ©bastien. The computers gurus came up one day with UTF-8 and all our problems should have been solved; one encoding to rule them all. Sweet, let’s all switch to UTF-8 ! Oh wait… legacy projects… PHP internal encoding is still not UTF-8 and functions like strlen() are still not able to properly process multi-bytes strings. It is being said that UTF-8 should land in PHP 6, but in the mean time, we still have to do something. Once you have detected the encoding, use iconv to convert it. This crunched through my 1GB database in no time and I was then sure that everything was in UTF-8. Of course, this is an example with a database, it can work with any data. This script could also be faster if all updates where done at the same time for each row. Please, save yourself some trouble, make sure all user content is in UTF-8. Recently the Heartbleed bug came to light. It is a bug in the OpenSSL library that causes information to leak from the server. It is an undetectable backdoor that allows to gain the private key of your server. Let’s just say it is VERY important to fix it. Most distros have been very quick to propagate the OpenSSL update, so running your favorite update manager should fix it in no time. The way SSL/TLS works is that the client and the server must agree on a cipher to use for encryption. If you were to attack a server, you would obviously use the least secure cipher. To protect against this, simply disable ciphers to be known as weak or those which flaws have been discovered. For Nginx, see their configuration reference. Since 1.0.5, they are using a sensible default. Otherwise, you can use the same as above. The private key must never be discovered. Otherwise, anyone could decrypt the content and could perpetrate a MITM attack. If the private key is too weak, it could eventually be guessed given enough data. However, SSL/TLS handshakes are very CPU intensive for both the server and the client. Using a key too long will considerably slow down your website. In most cases, 2048 is perfect. I am not a security expert, I simply happen to have done hosting for quite a time. I suggest you do not take my word blindly and go check this very pertinent paper from SSL Labs.